News item: Turks in Germany not interested in assimilating. So German Turks don’t want to be Germans. How shocking! It is so out of character. Muslims who don’t want to fit in? Really? But what’s the big deal anyway? Hey, in Justin Trudeau’s Canada we don’t want anyone to assimilate. We want them to “integrate”. We want them to maintain their “identity,” and offer us the benefit of their traditions, their fresh perspectives, and their cuisine. Especially their cuisine. I mean, that is one thing that I learned from Anthony Bourdain. It is all about sampling a nation’s cuisine. That’s the litmus test of a nation’s and a culture’s worth. “Oh, your country is guided by a barbaric seventh-century worldview? You oppress women? You support terror and jihad? No problem because the pita bread and the sweet coffee you serve is wonderful!” Anthony taught me a lesson. You must never pass judgment on a culture or a people until you have actually dined with them. You accept their gracious hospitality, look into their eyes, laugh at their jokes and praise them for their culinary skills. In other words, you get to know them as human beings. Face to face. 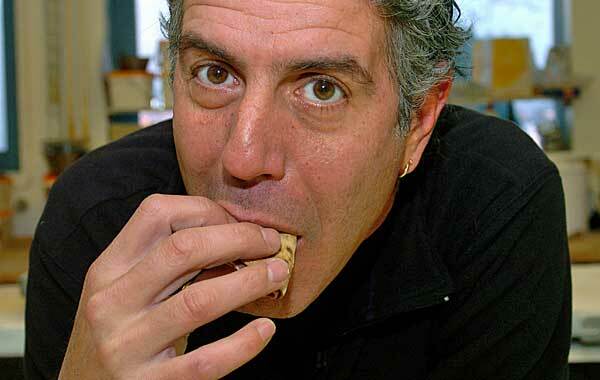 Be sure to tune in this Sunday on CNN for another installment of Anthony Bourdain’s “Unknown Parts”. Next stop: North Korea. Anthony will be taken on a guided tour of the Glorious People’s Republic, where once again he will be invited into the home of a normal, average hard-line Communist family who will reveal that our stereotypes are all wrong. Join Anthony and his hosts and you will understand that deep down these robotic cogs of the Orwellian nightmare that is North Korea are friendly folks just like you and me. They too love their children and they love their food. Oh their food! You haven’t lived until you have had their food. Don’t believe me? Then you ought to taste their rice! That is, when it’s available. Sometimes millions of North Korean go on a crash diet. Ethnocentric Americans , nativists, bigots and White Supremacists might call it a famine, but it is really just a form of collective weight management as practiced by a unique and exotic culture. In case I forgot to tell you, all cultures are created equal. Except ours of course, which is a decadent, racist, sexist, homophobic and materialistic legacy of Western imperialism and colonialism that deserves to be diversified out of existence by mass immigration and state-mandated multiculturalism. Didn’t they teach that to you in college? It’s part of the anti-Western canon. You see, despite our differences we are really all just the same. People are people the world over. Somali pirates, jihadists, pizza delivery men, hockey moms, radical Imams , badminton players, pedophiles, suicide bombers, Americans, Nigerians in Boko Haram….just people. All part of the human family. And we can all get along if only we can sit down and break bread with each other. Call it “inter-faith dialogue” over dinner. You too can co-exist with people who want to kill , subjugate or displace you. All it takes is an open mind and an empty stomach.